How long O Lord! when shall I happy bee, How eager thirsts my panting soul for thee, The haughtiest necks beneath thy power have bow'd, Thy Curss finds out the wicked & the proud, But painfull shame, O God from me remove, Who thy dear laws desire to keep & love, Me how they please, let Princes causless treat, And share who wish'd the favours of the great, I envy none am pleas'd & happy still, In Meditations of thy holy will, Thy words my joy, I need no joy besides, They my sweet Councellours & they my faithfull guides. 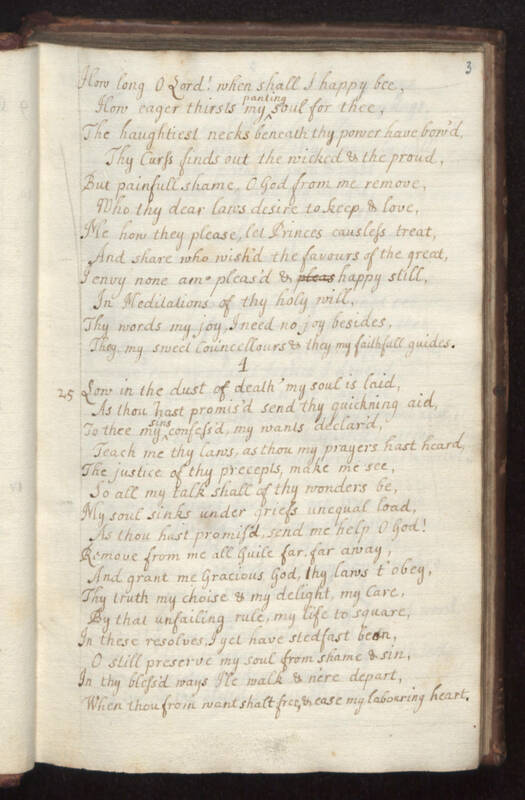 4 25 Low in the dust of death' my soul is laid, As thou hast promis'd send thy quickning aid, To thee my sins confess'd, my wants declar'd, Teach me thy laws, as thou my prayers has heard, The justice of thy precepts, make me see, So all my talk shall of thy wonders be, My soul sinks under griefs unequal load, As thou hast promis'd, send me help O God! Remove from me all Guile far, far away, And grant me Gracious God, thy laws t' obey, Thy truth my choise & my delight, my Care, By that unfailing rule, my life to square, In these resolves, I yet have stedfast been, O still preserve my soul from shame & sin, In thy bless'd ways I'le walk & n'ere depart, When thou from want shalt free, & ease my labouring heart.